We’d love your help. Let us know what’s wrong with this preview of Shallow Breath by Sara Foster. But as Desi retu How far would you go to save someone you love? To ask other readers questions about Shallow Breath, please sign up. “It’s about connections, across difficult boundaries,” comments Sara Foster, in describing her third novel SHALLOW BREATH. And there are so many extraordinary connections over the twenty year span of the story that your head will spin; but spin in a good way where you keep wondering what impact did this character have on this one. Even the animals in the book are connected and their impact on the human characters is also long-ranging. If you have ever visited or lived in West "DEEP CONNECTIONS"
If you have ever visited or lived in Western Australia you will also find the factual component of SHALLOW BREATH fascinating and well-researched, as Foster skilfully weaves a tale of intrigue surrounding the main character, Desi, who once worked in the real-life "Atlantis Marine Park" outside Perth which closed in the nineties. The story begins with just-released-from-jail, Desi Priest, returning to her home by the Indian Ocean to hopefully reconcile with her teenage daughter Maya. All we know is that Desi did something unthinkable and inexplicable and Maya is finding it difficult to understand and forgive her. Told in five parts via multiple points of view, Desi recounts her life in the nineties whilst working at Atlantis just as it is closing. It was there she met AmericanConnor, a passionate marine biologist, with whom she develops a friendship which takes them further than she ever expected. In present day, a stranger, Kate, arrives in town and it is clear she is more than a visiting tourist. She has a dangerous agenda that is only revealed at the end of the book. There are many secrets kept by each character and slowly the pace builds as the character perspectives flow back and forth to reveal how each character connects with Desi’s past and will impact on her future. For those who love a psychological mystery, SHALLOW BREATH will see you turning the pages into the wee hours of the morning. Along the way, there are some fascinating insights into animal conservation, dolphins and even orang-utans as the story travels from Western Australian to many countries. Whilst it doesn’t beat you over the head with its conservation issues it certainly takes you to places where you will feel angered by the brutality but also encouraged by the bravery of those who fight against that cruelty. SHALLOW BREATH is a modern Australian saga, written by an author who knows how to breathe life into characters. The story reaches through the pages pulling you into its watery depths and when it is over the characters will stay with you as if you’ve connected deeply with new friends. Shallow Breath is the third psychological suspense novel to be released by Australian author, Sara Foster. It’s a slow-building story that explores worldwide issues of animal cruelty and the conservation efforts of those who dedicate their lives to protecting animals. It looks at issues pertaining to five different species of animals including sharks, dolphins, elephants, kangaroos and orangutan and though set primarily in Western Australia it does span five continents. Shallow Breath switches vi Shallow Breath is the third psychological suspense novel to be released by Australian author, Sara Foster. It’s a slow-building story that explores worldwide issues of animal cruelty and the conservation efforts of those who dedicate their lives to protecting animals. It looks at issues pertaining to five different species of animals including sharks, dolphins, elephants, kangaroos and orangutan and though set primarily in Western Australia it does span five continents. Shallow Breath switches viewpoint between six connected characters through short chapters that are all associated with various animal causes. There’s Desi who worked with and researched Dolphins. She’s just been released from a 15 month gaol sentence and hopes to reconnect with her eighteen year old daughter Maya. She’s been caught up in a horrific situation where kangaroos are being murdered and beaten, leaving their joeys orphaned and sometimes injured. Along with Maya’s friend Luke, they try to save these kangaroos and attain evidence to stop these cruel acts. Connor is Maya’s deceased father whom Desi is still grieving. His ex-partner Elizabeth is an activist for elephants while his best mate Pete works with orangutans. Desi’s brother Jackson works with sharks. It was fascinating how each member of this extended family were involved in working with and protecting animals- if not a little convenient for the story to cover such a broad coverage of conservation programs. I’ve enjoyed Foster’s last novel, Beneath the Shadows so when the opportunity to read Shallow Breath became available I was really excited. It’s got such an interesting premise and I’ve read some really raving reviews for this story, but I was a little disappointed. I appreciate the research and the underlying messages in the story but I feel it’s execution was a little weak which came as a surprise to me after reading so many 4 or 5 star reviews for it. I’m afraid I’m that of an outlier in my review of Shallow Breath. The pacing of the story is quite slow, which at first really worked for me as each of the characters viewpoints began to unfold. However, the suspense that I expected from this novel didn’t really make its mark until the final quarter of the story. The majority of the novel is focussed on the past, through flashbacks and memories in each of the character viewpoints over a twenty year period. The two major secrets, that of why Desi tried to run down her best friend’s dad and why Kate (Desi’s belated boyfriend’s daughter) has come to see her, when they were unveiled it was a bit of an anti-climax. I expected some kind of emotional response from various characters but the truths seemed to be accepted relatively calmly. The last part of the story is quite rushed with all the characters coming together to fight for a single cause- which I admit was very brave and courageous- and the ending left many things unresolved. While I appreciated what this story set out to do and I was fascinated, confronted and admiring of the conservation work that takes place within Australia and abroad, I did feel the slow-pace of the story, lack of suspense and anti-climax associated with character conflict let the story down. Shallow Breath is an ambitious story exploring five different animal species and spanning five continents and certainly made me think about the extent of animal cruelty that still exists in this day and age. I encourage you to check out other reviews by readers who speak highly of Shallow Breath before deciding whether to give this one a go or not. While I found it interesting, I found this a hard book to read for several reasons. The first is the way it is structured. The chapters jump around from one character to another and then to complicate matters from one time period to another so it never really gelled as a story for me. Just as I was settling down with Maya, Desi's daughter or Desi, recently released from prison, I was hauled off to another of the several characters. This meant I never actually felt greatly emotionally connected t While I found it interesting, I found this a hard book to read for several reasons. The first is the way it is structured. The chapters jump around from one character to another and then to complicate matters from one time period to another so it never really gelled as a story for me. Just as I was settling down with Maya, Desi's daughter or Desi, recently released from prison, I was hauled off to another of the several characters. This meant I never actually felt greatly emotionally connected to any of them. All the strands came together in the end and the connection between the characters and events of the past explained but even the ending I found left me feeling very flat. The second reason it was hard to read was the subject matter. I don’t deal well with reading stories about domestic abuse and physical violence of one person to another or with reading about the violence of people to animals. The scenes with the kangaroos and their joeys, I found particularly hard as these creatures are regular visitors on our front lawn. Similarly with the dolphins and the inhumane treatment they are subjected to, when I look out at wasters nearby and see these sleek gentle creatures. So I found myself skimming and skipping bits because I couldn’t bear to read them. So while it is interesting and a lot of research has gone into it and it has a lot of worthwhile information to convey I didn’t find it as satisfying or engaging a read as I expected. Others may react differently. Reviewing one's own book always feels a little, er, wrong - and now with the recent furore over authors secretly high-fiving themselves with maximum star allocations, I'm not sure this is PC at the moment! However, I hope you'll forgive me this one five-star review, because I love this book just as much as my two previous ones and want to cheer it on its way. I work extremely hard on all my books, but this one was particularly intense - I lived and breathed everything about it for a year, and I' Reviewing one's own book always feels a little, er, wrong - and now with the recent furore over authors secretly high-fiving themselves with maximum star allocations, I'm not sure this is PC at the moment! However, I hope you'll forgive me this one five-star review, because I love this book just as much as my two previous ones and want to cheer it on its way. I work extremely hard on all my books, but this one was particularly intense - I lived and breathed everything about it for a year, and I'm passionate about the conservation themes that form the backdrop to the family story. I hope that readers enjoy the suspense, become engaged with the wider issues, and feel these characters come to life as much as I did. I am really missing them right now, so perhaps there will be a sequel! Bestselling author Sara Foster presents her third novel, Shallow Breath, a compelling story of loss and love. After two years of incarceration, Desi Priest is finally free to return home and begin making amends for the impulsive act that destroyed her family. While her long term friend, Pete, welcomes her back with open arms, her teenage daughter, Maya, will barely talk to her, neither her father or he brother, Jackson, can look her in the eye and her best friend, Rebecca, may never be able to forgive her. Unfolding through multiple perspectives, Shallow Breath moves between the past and the present while roaming over five continents. It's an ambitious range that Sara Foster manages well, building a comprehensive picture of her characters and their passions. As Desi contemplates her future she recalls her past, her short lived career working with the dolphins of the Atlantis Marine Park, her relationship with Maya's father, Connor, an American marine biologist who was tragically killed before Maya was born, the dreams she gave up to raise her daughter and the tragedy that led to her prison term. Meanwhile Pete continues to try and protect Desi from some harsh truths, abandoning his own dreams to support, Maya rebels against her mother's concern, and Jackson is distracted by the enigmatic Kate, whose secret has the potential to destroy them all. The author's passion for animal conservation is a central issue in Shallow Breath, which explores the abuse of kangaroo's, the horrors of dolphin slaughter in Japan, the threats to the orangutan-tan in Sumatra, the diminishing population of whale sharks off the coast of Galapagos Islands and the hunting of elephants in Africa. Though I felt at times the information crowds the story, the information is thought provoking and inspires compassion for these threatened creatures. One of the settings of the novel that particularly appealed to me was the West Australian town of Two Rocks where the the Atlantis Marine Park once stood. I have fond memories of visiting the attraction regularly as a child and remember well my delight at seeing King Neptune towering over the entrance on our approach. My family moved to New South Wales in 1988 so I wasn't aware that the park was closed just a few years later and I was saddened to learn of it's demise. An engaging novel that is sure to haunt you, this is an absorbing read. Dive into Shallow Breath - you won't regret it. This review has been hidden because it contains spoilers. To view it, click here. Shallow Breath is the hotly anticipated new novel by Western Australian suspense writer Sara Foster. It is a gripping tale of love and loss in the context of environmentalism. It is said to be Foster’s ‘love letter to the ocean’ highlighting animal cruelty in Australia and around the world and the extreme measures conservationists are prepared to go to help prevent those atrocities. Foster forces the reader to question the perceived superiority of the human race; to decide who, in our world, are Shallow Breath is the hotly anticipated new novel by Western Australian suspense writer Sara Foster. It is a gripping tale of love and loss in the context of environmentalism. It is said to be Foster’s ‘love letter to the ocean’ highlighting animal cruelty in Australia and around the world and the extreme measures conservationists are prepared to go to help prevent those atrocities. Foster forces the reader to question the perceived superiority of the human race; to decide who, in our world, are the real ‘animals’. Water, as depicted on the cover, makes a powerful symbol, and it is used to great effect throughout the novel to emphasise the human experiences of emotional depth, peacefulness, suffocation and fear. Shallow Breath is not for the faint hearted, especially if you are an animal lover, but the conservation subplot is original and informative without being overly didactic. Foster drew inspiration from the infamous documentary about Japanese dolphin hunting, The Cove, and went on to travel widely and thoroughly research the animal welfare issues at stake in this book. The graphic and troubling incidents range from plight of the Sumatran Orang-utans to African elephants, right through to kangaroos on our own doorstep. It is uncomfortable reading, but these are stories that must be told. There are author’s notes, acknowledgements and suggested reading group questions at the end of this book to stimulate discussion on these matters. I note that a percentage of royalties is going to animal charities, too. But Shallow Breath is by no means a dry lecture on animal rights. The opening pages offer one of the most gripping introductions I’ve read in some time. The protagonist is deep sea diving and her tank is caught on a thick piece of netting. She has five minutes of air left. If she cuts herself free from the equipment, will she be able to push herself to the surface and breathe? Or will one of the ocean’s other inhabitants intercept her on the way? From this tantalising starter, the novel continues apace with smart, evocative writing. I caught myself reading and re-reading phrases admiring how cleverly they revealed details of the characters’ lives without spoon feeding the reader. This is the first of Foster’s novels I’ve read, but I’ll be seeking out more of them simply to watch the evolution of her writing style. The initial intensity of Shallow Breath soon gives way to a more tidal pattern; it ebbs and flows between different narrative voices, the past and the present. Fresh out of prison, Desi Priest returns to her home in coastal WA to begin reconnecting with her family and friends. Each of the key players in her life – daughter Maya, brother Jackson, father Charlie and best friend Rebecca – has a different way of responding to her crime and to her potential reintegration into their lives. Her long term friend, Pete, is trying to protect her from some harsh truths; while Jackson is falling for the charismatic Kate – the niece of Connor, Maya’s deceased father. Each has their share of secrets as well as their particular passions. Needless to say, the steady unveiling of all that lies below the surface is suspenseful, complicated and deeply mired in oceanic metaphors. Foster shows us how closely related we are to the animal world by placing her characters in the same predicaments as hunted animals – suddenly separated from their parents, for example, or fearfully trapped underwater. The feeling of suffocation was palpable through the novel, whether it be from immersion or from the unspoken words seemingly stuck in people’s throats. Foster is a gifted writer who has much to teach us in amongst this intriguing family saga. Desi was on her way home with Pete, from the prison where she had spent the last almost two years of her life. The mistake she made devastated her family, her impressionable teen daughter Maya, her brother Jackson and her surly father…along with her dearest friend Rebecca and her family. She needed to make amends to Maya, but she wasn’t sure where to start. When Desi was young, a teenager herself, her love and passion for the ocean and all creatures within it, came into being. She especially love Desi was on her way home with Pete, from the prison where she had spent the last almost two years of her life. The mistake she made devastated her family, her impressionable teen daughter Maya, her brother Jackson and her surly father…along with her dearest friend Rebecca and her family. She needed to make amends to Maya, but she wasn’t sure where to start. With Desi having trouble re-connecting with Maya, who was angry with her mother, and in no mood to forgive her, and the appearance of a total stranger, who seemed to know a lot about the family..to Jackson’s unexpected feelings for this stranger, plus his guilt and problem with his drinking, the action was full on. But I struggled to connect to some of the characters in this novel. There were quite a number to keep track of and the story jumped from one person to another, with the past and the present going back and forth. The connections seemed confusing at times but everyone came together in the end, so even though I enjoyed it, I was a little disappointed. Shallow Breath is Sara’s “love letter to the ocean”. A deeply touching novel highlighting both the atrocious acts of Best-selling psychological suspense writer Sara Foster took months to work up the courage to watch The Cove, an infamous documentary exposing Japan’s dolphin hunting culture, and when she finally did she wept for much of the film. A long-time animal lover, Sara couldn’t turn away from what she had seen. A year later, she visited “the cove” for herself, determined to write about it. Now, she is coming home to make amends: to her daughter, Maya, who’s nurturing her own dangerous plans; to her brother, Jackson, who blames himself; and to her close friend, Pete, who has spent years shielding her from a devastating truth. This book sounded intriguing. When there is a secret that you can only find out by reading, I’m hooked from page one. This is exactly what happened with Shallow Breath, Australian author Sara Foster’s third novel. Desi has just been released from prison after being in there for 15 months. Her daughter, Maya, isn’t excited about her mother returning home as she is still angry with her. Maya is currently living at the caravan park run by her grandfather Charlie. They aren’t close but it provides Maya with a somewhat stable environment. She is checked up on by her uncle, Jackson and her mum’s best friend/the only father figure she has ever known, Pete. There is still tension between Maya and Desi because she no longer feels welcome at the home of Rebecca, Desi’s childhood friend. To complicate matters further, there is someone waiting for Desi upon her return. Kate, the niece of Connor, Maya’s father, wants to talk to the woman her Uncle loved and to ask for her help. Covered in secrecy, Kate keeps her intentions to herself, not even telling Jackson who she develops a relationship with. She wants to ask Desi because she knows that she won’t refuse, but she’s asking for a lot. Secondary to the people in the story, the undercurrent of Shallow Breath are all the animals. The characters are passionate about the conservation of dolphins, kangaroos, orang-utans and elephants. Desi has spent most of her adult life swimming with dolphins and studying their communication patterns with Connor and on occasion, Pete. Pete is passionate about the conversation of the dying breed of orang-utan. Elizabeth spent years in Africa protecting elephants from poachers. Maya has recently been helping a local boy, Luke, rescue kangaroos and their joeys after his stepbrother and his friends torture them. Kate also has a passion to help dolphins which is where Desi’s help can be required. You know from the beginning that Desi has (obviously) done something to wind up in prison and that what she did has affected the lives of many. This secret is slowly unraveled throughout the book, enough to keep you guessing and to satisfy your curiosity. What impact are you hoping the book with have on animal conservation in Australia and internationally? ‘I don’t want to think about that, or watch that, because it’s too depressing.’ And I think these are probably the people who would shout the loudest if they listened and witnessed some of these issues and realised that we can get behind all sorts of fantastic conservation groups and support them to make a difference. And that it’s imperative we do so quickly, because the world is changing at an unprecedented rate. Even if it makes you uncomfortable and upsets you, read Shallow Breath, become aware of the reality of animal cruelty so that you can make a difference. The characters, the settings and the circumstances are enough to keep you interested. I thoroughly enjoyed reading this book and I’m keen to read Sara’s other books now. When the book opens, Desi has just been released from prison and is returning to the small Western Australian town where she has lived her entire life. Desi's passion is the sea and particularly dolphins - a passion that she shared with Connor, the father of her now grown up daughter Maya. The book encompasses a large group of inter-related characters, all of whom seem to be harbouring some secret and all of whom share a deep love of wildlife, whether it's dolphins, whale sharks, elephants or or When the book opens, Desi has just been released from prison and is returning to the small Western Australian town where she has lived her entire life. Desi's passion is the sea and particularly dolphins - a passion that she shared with Connor, the father of her now grown up daughter Maya. The book encompasses a large group of inter-related characters, all of whom seem to be harbouring some secret and all of whom share a deep love of wildlife, whether it's dolphins, whale sharks, elephants or orang-utans. It took me a while to get into this book. It jumps around from one person to another and I was having problems sorting out who they all were and how they connected to one another. I also realised that while I love animals, I don't have the same passion for them that the author clearly does, and I got a little tired sometimes of being told repeatedly about the terrible things that are happening to animals around the world. I thought Sara's passion for conservation shone through in this book - I love to learn things when I'm reading a novel and I learned a lot about what happens to our animals in this story. The research that Sara must have had to wade through to write this book would be astounding, but the story never feels weighed down by detail. It all fits seamlessly into the plot, which is gripping. I was completely absorbed by Shallow Breath, its characters, the story and the setting. I thoroughly enjoyed Shallow Breath. A heart breaking story of love, loss and family secrets. As a born and bred Western Australian, it was fabulous to read about places that I have heard about, places I have been, and situations that I remember hearing about in local news reports. Sara has done a wonderful job of taking the reader into the lives of the various characters, with each chapter devoted to one character. This enables you to slowly get to know each character, at the same time learning a I thoroughly enjoyed Shallow Breath. Sara has done a wonderful job of taking the reader into the lives of the various characters, with each chapter devoted to one character. This enables you to slowly get to know each character, at the same time learning a little more of the story and the individual characters' piece of the final puzzle. The final chapters unfold seamlessly, leading the reader deeper into what, for me, was a completely unexpected ending. I found myself reaching conclusions as to the final reveal, which was nowhere near the actual ending. I was, instead, led down a completely different path, which was by no means pleasant but sadly made sense for each character. After reading psychological thrillers Beneath the Shadows and Come Back to Me I had high hopes for Sara Foster’s third novel, Shallow Breath. She did not disappoint - delivering another taut, suspenseful read bursting with family secrets and hope. Just released from prison after making a horrible mistake that impacted on family and friends, Desi Priest has returned to her childhood home to make amends with the people she’s hurt, beginning with her daughter, Maya. Her return is not exactly welcomed by Maya, who still harbours anger and confusion about Desi’s actions. And her long-time friend, Pete, knows that now is the time to share news with Desi he’s held back for a long time, all the while believing it was for the best. Meanwhile, Kate, a beautiful stranger, comes to town, entrancing Desi’s brother, Jackson, but with a hidden agenda. It has something to do with Desi, but what? As Jackson tries to piece together this mystery, Desi tries to settle back into her old life and Pete tries to smooth the way, Maya is busy with her own secretive mission, one not without danger. When Kate approaches Desi for help, Desi is at first reluctant (unlike Maya), but soon sees the request as a means for redemption. Will she finally be free of the past? Are second chances possible? Shallow Breath is told from multiple perspectives, allowing the characters and plot to develop with depth and balance. In a story about secrets and conflict, it’s really a useful technique because it gives the reader a far bigger picture of the events leading to, and following, Desi’s imprisonment. As the reader finds, each character is withholding something. They all have reasons for not sharing; stubbornness and/or a need for independence are strong motivators for some characters, but really, they are all protecting someone, even if it is their own self. Somehow the secrets are all connected, all hinge to Desi in some way; Foster does a great job connecting them all in a believable manner. The title and the cover do the book justice - I particularly like the image of the hand touching the water and the reflection below. It sums up the book so well - beneath the surface of the town, the ocean and the characters lurk secrets, fears, horrors, anxieties, resentments, love and more, but most only see what first appears. The title Shallow Breath speaks of the shallow breaths people take when anxious or not relaxed, which really, most of the characters are in this novel; it also links to the deeper breaths needed in order to dive deep (whether into the ocean, as in the case of some of the characters, or into yourself). As a Perth resident, I found it interesting to read about the long-closed Atlantis Theme Park - I've only lived here 12 years, so I'd never heard of it, but Blue Eyes had. It added to the authenticity of the story and context to events that took place later in the novel; Desi had worked at this park so her decision to help Kate is in keeping with who the reader sees she is. But what stole my breath in this novel was the fascinating/shocking storyline involving the slaughter of dolphins at Taiji, Japan; I am sad to say I knew little of this and this insight was revealing, repelling and saddening. It's food for thought. Shallow Breath is one of those books you want to dive into and not come back out of until it's finished. It's well-crafted with thoughtful, authentic characterisation and a compelling storyline. Foster has a bright future ahead of her as a suspense writer - she has the gift for telling a tale and telling it well. If you haven't already checked out her books, I'd recommend them all. Each one is different, yet perfectly flavoured with psychological suspense. 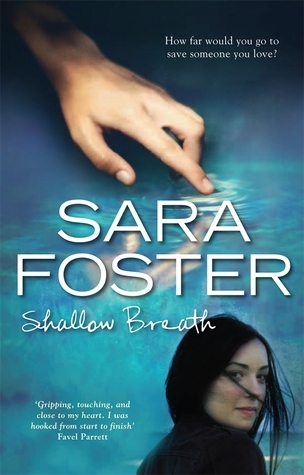 Shallow Breath is the first book I have read by Australian author Sara Foster. It’s an intriguing and compelling story about a family trying to reconnect after an incident nearly two years ago that left Desi Priest, a mother, sister and daughter, in jail. The book opens with Desi getting out of jail and returning to the area where she hopes to reconnect with her family. Desi’s past means it will not be as straightforward as it seems. A recent arrival to area, Kate brings backs memories of when Desi and Connor, her former partner and father of Desi’s child Maya, were together. Kate is Connor’s niece and she brings trouble with her as she waits for Desi, insinuating herself into the family’s life and getting comfortable with Jackson, Desi’s younger brother. It infuriates Maya who is desperate to learn more about her father’s family. This is just the start of Kate’s character who has many layers that slowly peel away as the story progresses. Adding to the complications, Maya, Desi’s daughter, has just turned 18. Legally she an adult, but she’s drifting down a dangerous path with no positive parental influence and that rough road may ultimately lead to jail. Desi and Connor’s friend, Pete, has tried to look after her but she rebuffs his help and he hasn’t a clue how to reach her. On top of Maya’s issues, Pete has Desi to deal with as he is shielding her from a “truth” that is potentially devastating, a lie he started many years ago. Then there’s Desi’s father who won’t speak to her because he’s hurt over what happened that fateful day. And finally, there is Rebecca and her family. The girls (Desi and Rebecca) grew up together and Rick worked for her dad but then the families started taking sides and then the incident happened. Desi is coming home to a complicated situation. Time will allow the secrets to be revealed so that they can move on, but can they with Desi having only one ally? After Connor left her, Desi had grown to depend on Pete over the years as he was the one connection between Connor and her family. But even Pete doesn’t know what the truth is except Desi and Jackson who is torn with protecting her and the rest of the family. With all that going on, you’re thinking this is going to be a compelling story about finding forgiveness and forging a new future. Well, yes, this book is about that but there is so much more to it! I think 2013 is going to be the year I discover Australian authors; I have read a smattering of works by Australian authors over the years but this year I have already read eight books, all from Australian authors. Each of them feature compelling writing and strong female characters, and this book is no exception. 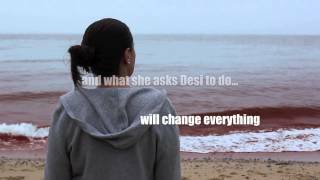 Desi’s regret at keeping secrets affected her relationship with family and friends. When these 20 year old secrets come to light, they do more than “clear the air”; they send Desi’s family on a journey travelling through the past and into the future, as they try to make sense of the past and take a glimpse into the future. Foster has written a book that looks at difficult family issues, as well as dealing with animal conservation, an unexpected sub-theme to this book, but it fitted into the narration seamlessly. Shallow Breath was an enjoyable book. Although the plot and the characters were interesting, I felt like there wasn't enough development regarding Desi's psychology and overcoming either her guilt or trauma caused by her past. I was also surprised to see the whole book was based around animal conservation - not that I minded, but it totally wasn't what I expected. Basically in the story we find Desi, a mother, widow and dolphin-lover, out of prison, determined to make amends to her friend and re Shallow Breath was an enjoyable book. Although the plot and the characters were interesting, I felt like there wasn't enough development regarding Desi's psychology and overcoming either her guilt or trauma caused by her past. I was also surprised to see the whole book was based around animal conservation - not that I minded, but it totally wasn't what I expected. Basically in the story we find Desi, a mother, widow and dolphin-lover, out of prison, determined to make amends to her friend and rebuild a relationship with her daughter. Even though she made a mistake which "destroyed her family", and spent two years in prison for it, it didn't seem Desi was particularly troubled psychologically: she returns to her town, her home, and sets out to find forgiveness in those she hurt, as if the last two years did not have much impact on her psychology. She does not haunted or broken from what she did or her years in prison. I would have liked more focus on what was in her psychology at the present time, but all we get are flashbacks to what led her to be in prison. In the one hand, Desi' character could be interpreted as determined and strong, but to me it actually was more unrealistic. I also found the book contained too much animal-related stuff. Every single character was passionate about saving animals (although which animal they loved the most differed between characters). Desi loves dolphins, Pete loves orang-utans, Jackson loves sharks, Elizabeth loves elephants ... There just seemed to be so much focus on the animals! And sure - animal conservation is important, but I think there was too much of that in the book - like it was out of balance. Although it was nice that the author had done research about animal conservation, I was a bit surprised when one of the characters listed out facts in their dialogue; I for sure would not be able to remember how many elephants die every year or how many are left in the world! The characters were all related to one another in some way, which on one hand meant the characters formed a tight-knit group, but sometimes I had to think hard to remember how they were all related. Kate is Maya's cousin, Elizabeth's and Connor's daughter, Jackson's crush ... the relationships could get a bit confusing and it was hard not to get lost! Apart from that, the book moved at a fairly good pace and the numerous flashbacks gave a comprehensive construction to each of the character's personalities and situations. It was quite well written but I thought there was often too much telling and not enough showing. Shallow Breath is the third novel by best-selling contemporary fiction writer Sara Foster. I feel that this book was meant to be written at this time in our history as it raises many critical issues about animal welfare, not just in Australia, but across the globe. I will admit from the outset that I’m not a ‘fast’ reader, and I don’t like to skim-read novels in the fear that I might skip over an important detail. This may have affected how I read Shallow Breath, as I felt that I didn’t experi Shallow Breath is the third novel by best-selling contemporary fiction writer Sara Foster. I feel that this book was meant to be written at this time in our history as it raises many critical issues about animal welfare, not just in Australia, but across the globe. I will admit from the outset that I’m not a ‘fast’ reader, and I don’t like to skim-read novels in the fear that I might skip over an important detail. This may have affected how I read Shallow Breath, as I felt that I didn’t experience everything that I wanted to get from reading it, but I recognise that had I finished reading the novel in one or two sittings, I think I would have had a more intensely emotional reading experience. Shallow Breath is centred around a family trying to repair itself following a terrible tragedy, while each character is trying to move on with their lives. It’s also about having to confront the past in order to move on in the present. The novel has an unusual and slightly complex structure that has been well-thought out by the author. The novel is divided into five parts and each part contains chapters told in the voices of the different characters: Desi, Maya, Pete, Jackson, Rebecca, Kate, Connor, and Charlie. Desi’s story begins in the past and is told chronologically, as well as parallel to the present narrative, which is being driven by the other characters. As the novel progresses, the different voices increase in number and Desi’s story finally meets up with the others in the present. Shallow Breath explores the plights of several endangered animals and reinforces to the reader why protecting and preserving all of them is incredibly important for our global ecosystem and for future generations. I found it interesting to read about a family of characters who are, mostly all, animal welfare activists. This made me consider whether I could extend the love and compassion that I feel for my own pets to other species of animals. Animals have been present in my life since I was born, so I’ve often thought of them as additional siblings or family members, and the interactions that we’ve had over the years have led me to conclude that they do feel love, as well as fear and pain. If animal conservation and welfare is something that you’re passionate about, I highly recommend that you visit Sara Foster’s website, www.shallowbreath.com, which contains lots of information about her research for the book, some interesting background information about each of the animals she focusses on in the book, as well as the names and contact details for different animal welfare and conservation groups. Growing up on the beautiful West Australian coast, all Desi ever wanted to do was work with dolphins. As a teenager that dream comes true when she gets a job at the Atlantis marine park near her home town. Devastated when the park is closed, she is thrilled to meet Connor, a young American who is just as passionate about dolphins as she is. Their relationship is passionate but brief when he is tragically killed, leaving her pregnant and alone. She works hard to provide a living for her daughter Growing up on the beautiful West Australian coast, all Desi ever wanted to do was work with dolphins. As a teenager that dream comes true when she gets a job at the Atlantis marine park near her home town. Devastated when the park is closed, she is thrilled to meet Connor, a young American who is just as passionate about dolphins as she is. Their relationship is passionate but brief when he is tragically killed, leaving her pregnant and alone. She works hard to provide a living for her daughter Maya, but is forced to leave her own passions behind for the sake of practicality. Then one impulsive action on Desi’s behalf results in her spending time in prison, leaving behind a splintered family and a community that ostracises her. Spanning several continents and told via multiple points of view, Shallow Breath has many threads that join together as the story progresses. Told both in present and past tense, you come to learn of just what has happened to Desi and what keeps motivating her to embrace what she is so passionate about. Suspenseful and compelling, you cannot help but be drawn into the ever evolving story, while gradually learning the back story of the main characters. I thought the multi POV worked well and didn’t ever feel like I lost my sense of time and place. Underlying all the family drama and the element of mystery of the past is the theme of wildlife conservation, primarily dolphins. Sara Foster has been extremely thorough in her research of the topic, managing to present a lot of (at times) alarming factual information within the confines of a fictional story. At times I thought there was some blurring between “showing” and “telling” this information, but can appreciate the difficulty of blending fact into fiction. In saying that though you cannot help but be affected by the plight of wildlife and horrified at some of the barbaric practices that still occur today. It certainly gave me an appreciation of just what conservation activists believe in and the realisation that without them many, many more animals would be extinct today. Although not quite as suspenseful as her previous novels, Shallow Breath takes you on a different journey, exploring how choices always have consequences and celebrating the bravery of those people willing to stand up for what they believe in, no matter what the outcome may be. Desi has just been released from prison, having spent two years there after an impulsive act that tore her family apart. Desperate to make amends she soon realises this will not be as easy as she hoped. Her teenage daughter Maya is aloof and distant, while her brother and father also struggle to maintain any sense of normalcy. Fortunately her friend Pete is in her corner and it is he who helps her negotiate her way back to her old life. Told through a multiple POV perspective, Shallow Breath also Desi has just been released from prison, having spent two years there after an impulsive act that tore her family apart. Desperate to make amends she soon realises this will not be as easy as she hoped. Her teenage daughter Maya is aloof and distant, while her brother and father also struggle to maintain any sense of normalcy. Fortunately her friend Pete is in her corner and it is he who helps her negotiate her way back to her old life. Told through a multiple POV perspective, Shallow Breath also travels across time, exploring the back story of Desi's life. As a teenager she became obsessed with dolphins, a love affair she cannot shake. Devastated when the marine park in Western Australia closed, she falls deeply in love with an American marine biologist named Connor. Falling pregnant to him at a young age, her life is forever altered when he tragically dies before their daughter is born - an event that forever shapes Desi's future. Interwoven into the storyline is the strong theme of animal conservation, in particular the plight of dolphins. There is a lot of factual information woven into the storyline and the author's passion for the subject is very obvious. It was certainly thought provoking and led me to read further on the subject. Although quite different to Sara Foster's other novels, there was also an element of suspense in Shallow Breath that kept me engaged from start to finish. I was also interested to learn a lot more about Western Australia, having read very few books that are set there. I thought the author captured the setting really well, enough so that I would definitely like to visit. This is one of very few books that have left me angry! Angry at the human race and the way beautiful and innocent animals are treated and slaughtered. This compelling story moved back and forth from past to present and highlighted just a few of the species under threat from abuse, slaughter, hunting and loss of habitat - the Australian Kangaroo, Dolphins in Japan, Orangutans in Sumatra, Whale Sharks in the Galopagos Islands, Elephants in Africa as well as also highlighting the brutality of domes This is one of very few books that have left me angry! Angry at the human race and the way beautiful and innocent animals are treated and slaughtered. This compelling story moved back and forth from past to present and highlighted just a few of the species under threat from abuse, slaughter, hunting and loss of habitat - the Australian Kangaroo, Dolphins in Japan, Orangutans in Sumatra, Whale Sharks in the Galopagos Islands, Elephants in Africa as well as also highlighting the brutality of domestic violence. Mix a dash of mystery, a dollop of environmental issues, a generous sprinkle of family ties and values, and you have Shallow Breath. Told from multiple points of view, and jumping around the time line of events, this story was enjoyable from start to finish. Obviously well researched and conservation is clearly a topic of interest for the author. I really enjoyed the dolphin story line throughout. Set in Australia, written by an awesome Aussie author - bonus! Advertised as a love story of the ocean. I would say it is also a love story of earth. And he creatures in it. And how we can and should do more to combat brutality against the animals and the environment in which we live. Often times this book was overly preachy and an obvious tool to encourage animal conservation. But I could overlook those moments to really get to know the characters, who except for Rick, all have many layers. A noble cause but a painful read. Slow building, lots of bouncing around, characters are poorly developed and strung together. I was surprised to see this book described as a psychological thriller. No thrills. I struggled to pick the book back up after putting it down, which is why it took me sooo long to read. I think this story could have been told more effectively in non-fiction. I'm happy it's over and that I can now move to a more engaging book. I received this book for free through a Goodreads First Reads giveaway. While this book has a good plot line, i personally found it hard to follow sometimes because it switches point of view so often. I didn't feel it was a smooth, flowing book. I however enjoyed the story and liked how the author hinted at things that happenned without coming right out and saying it. Sara Foster has done it again with her third novel, writing another story that has readers yearning to turn the pages to see what happens next. Wow.It took me a few chapters to initially get into the swing of this book, but I am so glad to have persevered. What a brilliant and poignant novel that rings with such relevance in the current events of today.So many of our beautiful,wild creatures are in danger of extinction- let us hope we can win in the war against poachers. Sara Foster is the bestselling author of five psychological suspense novels: THE HIDDEN HOURS, ALL THAT IS LOST BETWEEN US, SHALLOW BREATH, BENEATH THE SHADOWS, and COME BACK TO ME. Born and raised in the UK, Sara worked for a time in the HarperCollins fiction department in London, before turning her hand to freelance editing, and writing in her spare time. It wasn't until 2007 that Sara decided to Sara Foster is the bestselling author of five psychological suspense novels: THE HIDDEN HOURS, ALL THAT IS LOST BETWEEN US, SHALLOW BREATH, BENEATH THE SHADOWS, and COME BACK TO ME. It wasn't until 2007 that Sara decided to pursue her dream of getting published, and she took time out from editing to finish her first book. COME BACK TO ME was published in Australia in 2010 and reached the Sydney Morning Herald top ten Australian bestsellers list. Her second book, BENEATH THE SHADOWS, reached No. 4 on the Australian Sunday Telegraph bestsellers list, and was published in the USA and Germany. Her third novel, SHALLOW BREATH, was long listed for the 2013 Davitt Award. Sara is very proud to have been one of the original editors of the bestselling Kids' Night In series, which has been raising money for the charity War Child since 2003. In 2004 she moved to Western Australia, where she lives with her husband and young daughters.